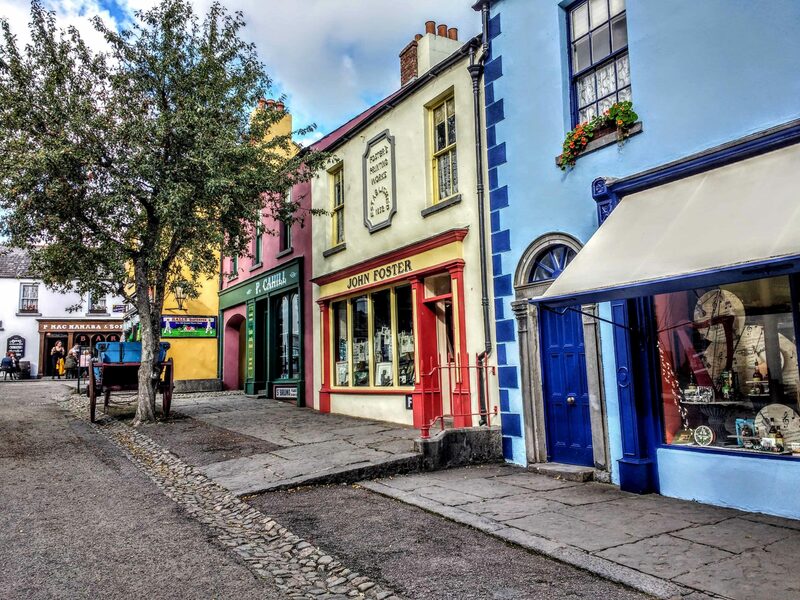 Bunratty Castle and Bunratty Folk Village are high on the Irish bucket list for visitors and locals alike. The imposing Castle can see seen just of the motorway and it is undoubtedly one of Ireland’s most loved castles. Bunratty Castle is a large 15th-century tower house in County Clare, Ireland. It is believed that it was originally a Norse settlement that was destroyed by Brian Boru in the 900’s. There are some fabulous deals on flights to Europe through Skyscanner, check out the Aer Lingus Flights from the US from only $377 return. If you are flying from Canada check out the Canadian link on Skyscanner where you can input your departure airport and your preferred arrival airport. To get to Bunratty from Dublin you can drive there in about 3 hours but it’s a bit of a journey. If you are in Galway, it takes just over an hour to get there. You can also get to Bunratty by train and bus. The bus service takes around 3-5 hours and the train considerably less. From Dublin, you would take the train to Limerick and when you get off the train, the bus depot is right next door so you can grab the bus to Bunratty directly from there. You could also take a taxi to Bunratty but that’s gonna cost you. Bus Eireann will take around 4 hours and the Dublin City Coach will take around 3 hours or so. Cost for the Coach averages around €22 Euros and Bus Eireann is a 4-hour plus journey at a cost of €35 Euros. Either of these buses drops you at the stop and the walk to Bunratty is around 10 minutes. During the 1200’s King Henry III granted the lands of Bunratty to Thomas De Clare a descent of Strongbow. It was De Clare who built the firs stone structure on the site. This castle was a simple stone tower and it stood near the river probably very close to the existing site. In the late 13th century, the lands around Bunratty had a population of around a 1000 people. The castle itself was attached by the O’Brian’s several times and was finally destroyed when De Clare was in England Being a stubborn man De Clare had the Castle rebuilt with a long narrow moat or fosse as it was known as in those days. The castle was attached a few more times and fell again in 1318. During a major battle, De Clare and his son Richard were killed and his wife the Lady De Clare burnt the castle down so nobody could take it and fled to Limerick. The family never returned to Bunratty and soon the existing castle collapsed into ruins. Several more owners came and went and there was even a third version of the castle, which went to ruin. The Bunratty Castle you see today was purchased by the Viscount Gort in 1956 and fully restored with the help of the Irish Government. The Castle was opened to the public in 1960 and included furniture, paintings, tapestries and works of art dating back to the 1600’s. 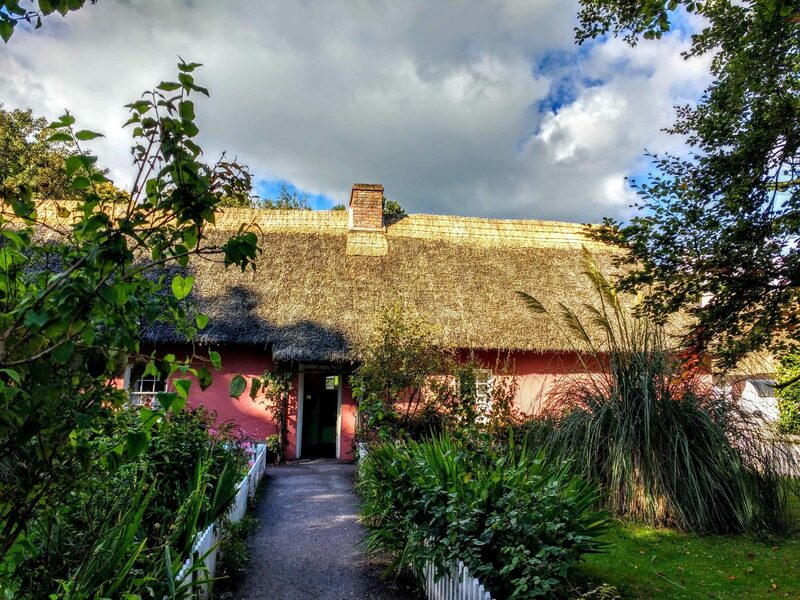 Today, everyone wants to see Bunratty Castle and take in the adjacent Bunratty Folk Park. 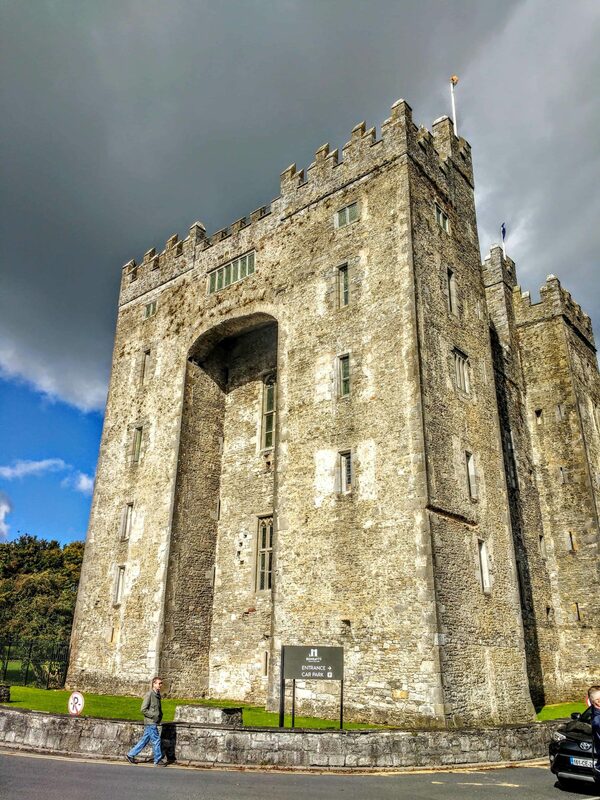 The castle is famous for its medieval banquets, which include the Bunratty Castle Entertainers and a fine 3-course meal. Bunratty Folk Park is an open-air museum featuring around 30 buildings, including the Ardcroney Church of Ireland, which moved here and reopened in 1998. The Castle and Village cost is €15.25 per adult and €10.50 per child and that covers the full experience of the castle and village but not the medieval banquet. The Castle showcases one of the finest collections of medieval furniture in Ireland. You can trek all the way up to the roof where you will see spectacular views of the area. 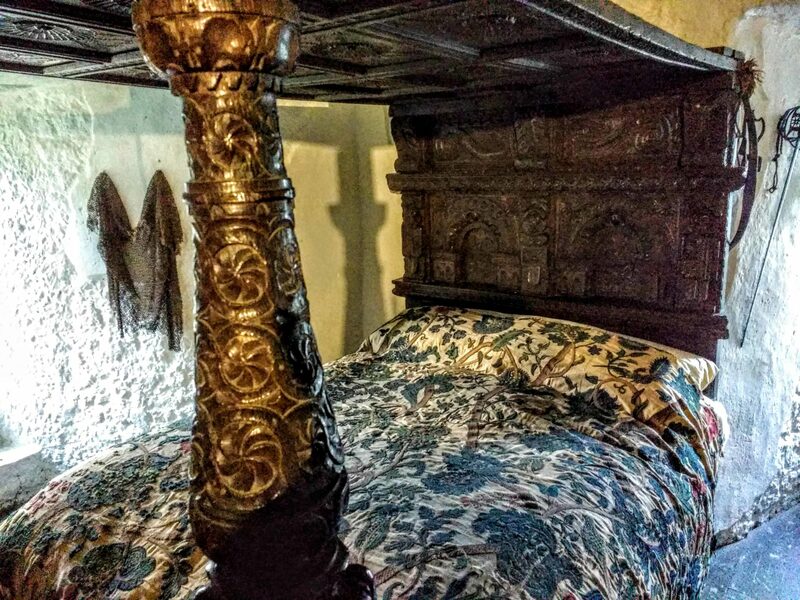 The rooms are filled with a collection of artifacts from the late medieval to the renaissance period and include rugs, tapestry, clothing, furniture, tools, art and weaponry. Admission is all year round. 9:00am- 5.30pm. Please be aware that the castle closes daily at 4pm to prepare for the Bunratty castle medieval banquet. If you are driving to Bunratty Castle, you will see the Castle of the main highway as it can’t be missed. Right beside the Castle, you will see from the motorway a bright yellow building. This is Durty Nelly’s and it is one of Ireland’s most famous pubs and offers a truly unique Irish experience through its history and character. Often copied but never replaced this truly unique piece of Irish heritage dates back to 1620. Enjoy the craic here in the pub where there’s live Traditional Irish music seven nights a week and festivals all year. The history of Durty Nelly’s is an intriguing one. The Durty Nelly whom the venue is named after was once the keeper of a toll bridge over the river Owengarney. The full history involves a rogue and a thief from Kilrush, stolen gold coins, a dream about poteen, an Irish Wolfhound, a miracle cure, the establishment of the Shebeen (a place that sells “the drink” but not legally), and fame forevermore. Durty Nelly’s is one of Ireland’s most famous pubs and offers a truly unique Irish experience through its history and character. Legend has it that Nelly herself introduced Poteen to Ireland. Durty Nelly’s offers some great affordable meals, excellent pints and a well-pulled Guinness. There is live music every week and you can even learn to pour your own Guinness at the bar. May the road rise up to meet you. May the wind be always at your back. May the sun shine warm upon your face, the rains fall soft upon your fields and until we meet again, may God hold you in the palm of his hand. 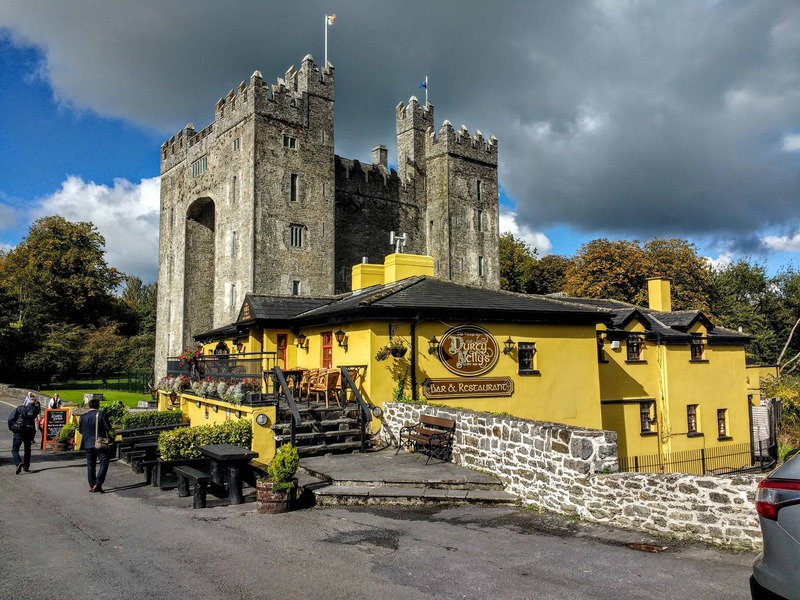 The Bunratty Castle Banquet is one of the most famous events in Ireland a raucous night of medieval revelry and food that takes place over 2 hours and a bit. The cost of the Bunratty Medieval dinner is around €63 per adult but reviewers say it is well worth it. The Banquet is quite the experience, upon arriving at the Castle a kilted piper, pipes you over the drawbridge where the hostesses who offer you the “bite of friendship” greet you. 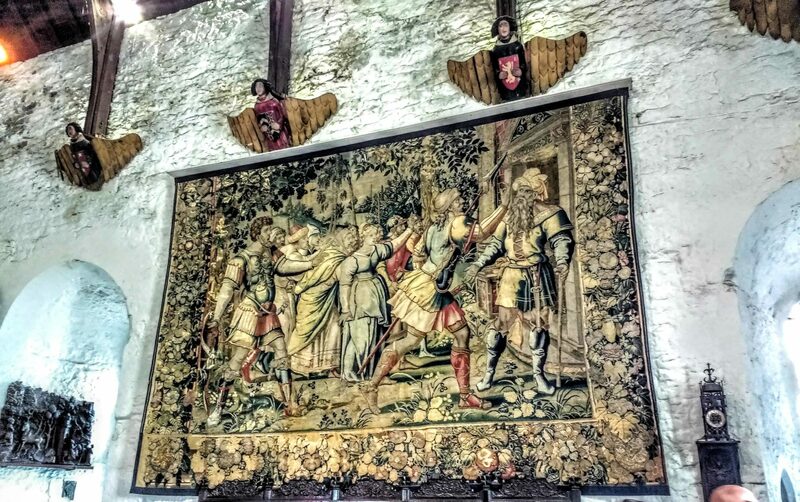 You then enter the Great Hall with its beautiful tapestries, long oak tables and benches where you can have a goblet of traditional Irish mead. The history of the Castle is relayed by the storytellers and is followed by a medieval madrigal. The Earl and his Lady are crowned before descending to the Banquet hall, which is lit by candlelight, and their guests await. The Banquet itself is a four-course dinner with wine accompanied by music from the Ladies of the Castle with harp and fiddle. The menu includes Spiced Parsnip Soup, Spare Ribs, Roast Chicken, locally grown vegetables and a lovely Apple pie for desert and yes, there are vegetarian options. The entire evening is a fantastic romp back to medieval times with scoundrels, butlers, Ladies and ancient music. There are two seating’s a night and reservations must be made. 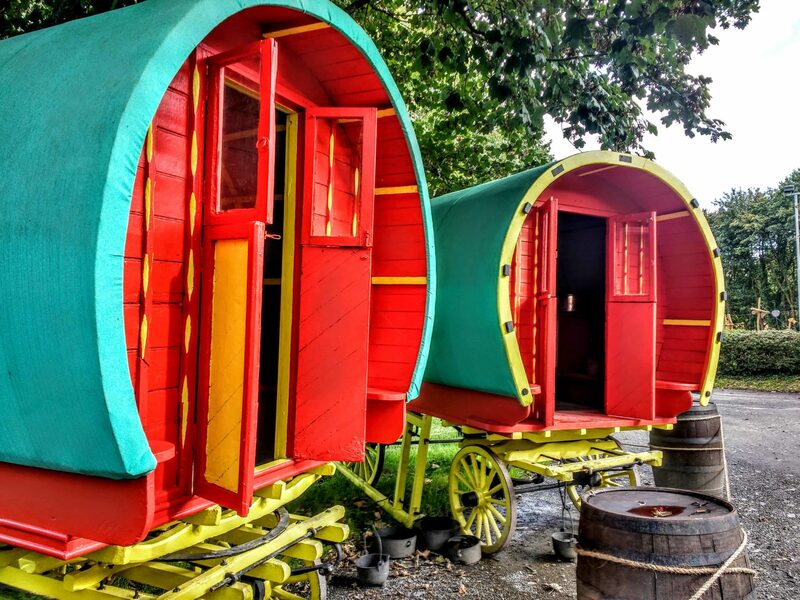 Visiting the Bunratty Folk Park is a real treat, set over 26 acres this amazing park includes over 30 buildings, a living village and a rural setting. There is a children’s play area, Gypsy caravans, and a Fairy Village. Costumed interpreters replicate the lifestyle and recreate the traditions from days gone by. These animators are well known in the park and include the Bean a Ti (woman of the house, the Royal Irish Constabulary Police, a schoolteacher, and various assorted other animators from spinners to blacksmiths to pub landlords. The homes include village shops, the poorest of rural homes to country cottages and fine Georgian residence. The Georgian home was built in 1804 for the Studdarts who were the last family to occupy Bunratty Castle. 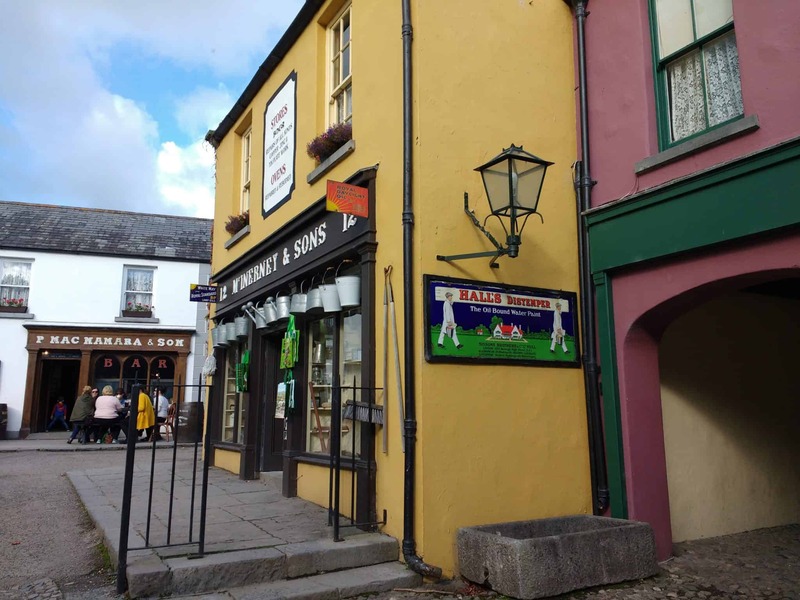 The village houses and shops in the Folk Park have been chosen from many different areas, to form a collection of typical 19th century urban Irish buildings including the School, Doctor’s house, Pawnbrokers, Pub, Drapery, Printers, Grocery, Hardware shop, Pottery and a Post Office. MacNamara and Sons, which sits at the top of the village street, is a fully licensed working pub so feel free to drop by and have a pint. Many of these old pubs were not only licensed for drink but they were the only grocery and hardware store in the area. The Fairy Village at Bunratty Castle is a very recent discovery. Located in a very pretty section of woodland these magical beings have gone undiscovered for hundreds of years. The fairy people welcome visitors into their village but are notoriously shy and may not always appear themselves! Explore the fantastic new willow tunnel and willow hut in the surroundings of the magical forest trail. The garden was built for the house around 1804. It is a fairly small walled garden around half an acre. There was probably a much larger garden located north of the castle, which would have been the kitchen garden. This walled garden was built in a protected area on the east side of the house. The walls are the only things remaining of the original gardens, but they have been extensively restored to their Regency splendour. 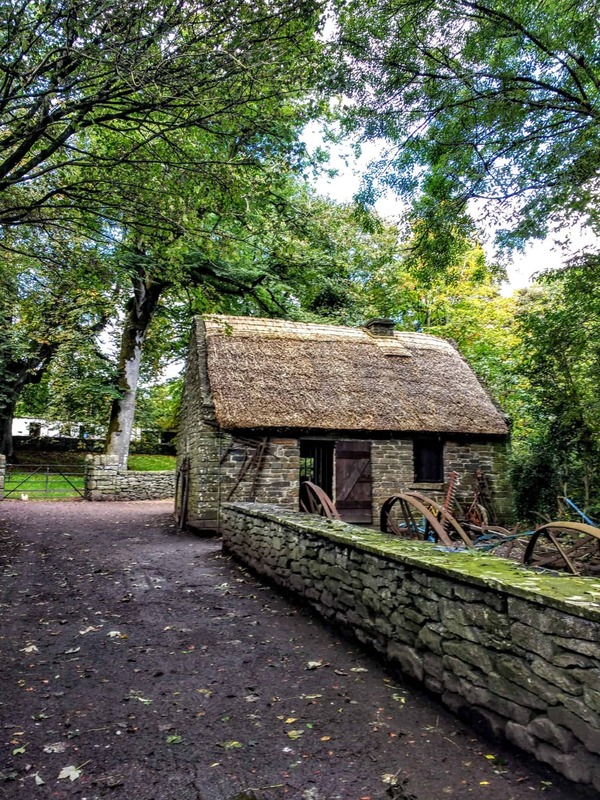 With help from a local grant, all of the gardens in the Bunratty Folk Village have also been restored to portray the plants and land use of the period. This is probably one of the few Folk Villages in Ireland that has accurately depicted and restored the horticultural heritage of Ireland. Have you been to Bunratty? What did you think? I would love to hear what folks thought of the Medieval Banquet as I couldn’t afford it myself…lol..